These three releases are part of DG's "Musik… Sprache der Welt" ("Music… Language of the World") series. As with the other issues in this series, which is devoted largely to recordings from the 1950s and early 1960s, these are mid-priced and rather minimalist. Instead of a jewel box, the disc is housed in a digipak, and the original cover art is used. Don't expect much in the way of booklet notes. Most of these recordings are new to CD, however, so collectors with a particular interest in the early years of DG will welcome these discs. DG's annotations have nothing to say about Karl Höller (1907-1987), except that he and Eugen Jochum both were Bavarian, and both studied composition with Joseph Haas in Munich. He came from a musical family, and showed his aptitude for the organ at an early age. Before the war, he taught in Frankfurt, and after the war, he taught at and later became director of the Munich Music Academy. The organ remained his instrument of choice, but he also composed works for orchestra, of which two are offered here. Both reflect his interest in music from the past: the Symphonic Fantasy (1934) is based on a theme by Girolamo Frescobaldi, and the Sweelinck Variations (1951) are based on that composer's "Mein junges Leben hat ein End'." Höller's music, at least on this CD, reminds me of Hindemith. It is the work of a fine craftsman, in the best sense of the word – not someone who would ever rock the boat, but rather an excellent academic, who understands polyphony and traditional symphonic development inside and out. The original Höller LP was part of DG's long-gone "Musica Nova" series. 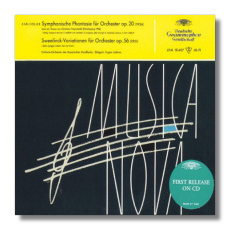 According to the CD's credits, the Symphonic Variations were recorded in 1957, and the Sweelinck Variations in 1987, but the latter date is surely a mistake. At any rate, neither of these recordings has appeared on CD until now. I admit to being unfamiliar with these works before hearing this reissue, but the performances seem fine, and the monaural sound has held up well. Eugen Jochum's Sibelius disc was recorded in Munich in 1955, and also included the composer's incidental music for the play Belshazzar's Feast. The first two selections have not been on CD before. (Night Ride and Sunrise was a coupling for the DG "Originals" issue of Jochum's Bruckner Fourth.) 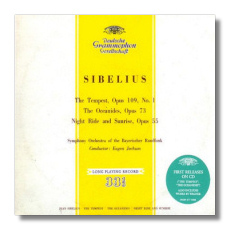 Many were surprised by the idea of Jochum conducting Sibelius, but these are fine readings, full of tensile strength and yet not lacking in atmosphere. Jochum brings out the affinities between The Oceanides and the Sibelius's Fifth Symphony, of which foretastes also can be heard in Night Ride and Sunrise. It would have been interesting to hear Jochum conduct the symphonies, particular from the Fourth on. The Bavarian Radio Symphony plays the music idiomatically, keeping it tough and unsentimental. I wonder if Sibelius heard this recording before his death two years later? I think he would have enjoyed it. The Wagner selections add considerably to the attractions of this CD. The two excerpts from Parsifal, also played by the Bavarian musicians, have a visionary quality. I doubt the "Good Friday Music" has ever sounded so engaging and yet so pure, and the Prelude's intensity will make some listeners weep. The Parsifal excerpts come from 1957 and are in genuine stereo. The Lohengrin preludes come from 1951. Except for the monaural sound, they hardly seem dated. Here, the orchestra is the Berlin Philharmonic, and its members play the music gleamingly. As in the Parsifal excerpts, Jochum does not sentimentalize the music, nor does he exaggerate it, but he colors it with exciting and spiritually moving results. 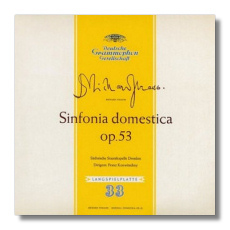 The orchestral works of Richard Strauss are closely associated with the Staatskapelle Dresden (here given its old-fashioned modifier of "Sächsische"), so a recording of the Sinfonia domestica, made in 1956, less than a decade after the composer's death, has its obvious interests. Konwitschny had a reputation for being a genial and informal conductor – not at all driven by ego or by a desire to impose himself on the music. ("The very opposite of Richard Strauss," I can hear some people saying under their breath.) The result is a performance of unusual and salutatory leanness. There is no posturing here, no straining after effects, no late Romantic excess - just a portrait of Papa, Mama, and Junior Strauss that is almost intimate, and certainly… well, domestic. There are many fine recordings of the Sinfonia domestica available, but Konwitschny's is special for its utter lack of pretension. Friedrich Witt is famous for just one work – the one presented here – and he is famous for it only because for about 50 years it was believed to be the work of another composer: namely, Beethoven. (The source of the confusion was a manuscript found in 1909 with the attribution "Louis van Beethoven.") Witt's "Jena" Symphony probably would not have received the handful of recordings it has received over the years were it not for this misattribution. I am glad the truth came out, because while this is a perfectly acceptable Classical symphony, there's almost nothing about that signals the coming phenomenon known as Beethoven. It could easily be mistaken for one of Franz Joseph Haydn's earlier and lesser-known symphonies, however. Konwitschny, in keeping with the style of the era, makes no attempt to play it in period style. This is what is known as a "big band" performance. Still, the conductor's leadership embodies masculine strength and attention to detail, so anyone curious about this "almost Beethoven" symphony should not hesitate, monaural sound notwithstanding. The Witt was recorded at about the same time as the Sinfonia domestica, and both recordings are marked by a higher amount tape hiss than on the Jochum CDs. This really shouldn't bother most people, however. Both of these recordings are new to CD.